Could we melt all the Ice in Antarctica if we Keep on Burning Fossil Fuels? 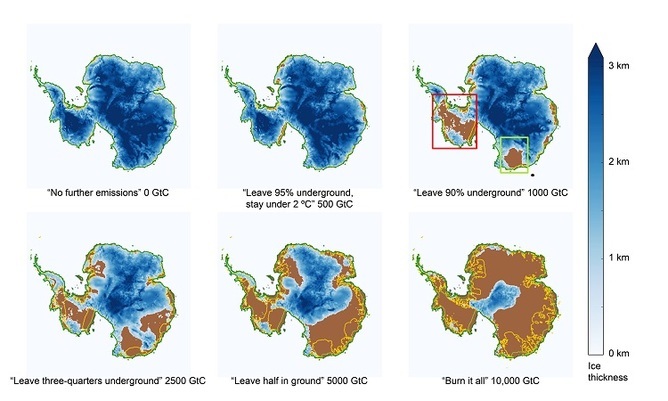 Here is a great “what-if”: if we (the human race) were to burn all available fossil fuels, could we melt the largest and most stable ice sheet on the planet – Antarctica? Could our collective industrial impacts on the planet possibly have that far a reach? . . . However, given unrestrained burning of fossil fuels, our study does show that the largest mass of ice in the world, including both the East and West Antarctica ice sheets, ultimately is vulnerable to irreversible melting – and dramatic sea-level rise. 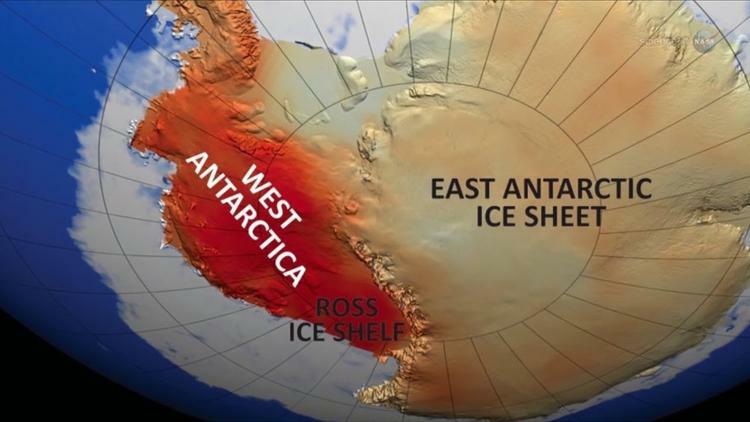 We already know that the Antarctic ice sheet has not always been there, and there is abundant geological evidence that around 50-100 million years ago, sea surface temperatures around Antarctica were pleasantly warm and vegetation on the Antarctic Peninsula was lush and warm-temperature. (And yes, prior to 65 millions years ago, there were dinosaurs living there too.) Our best reconstruction of atmosphere CO2 at the time is somewhere in the region of 556-1,112 parts per million (ppm) and higher than the almost 400 ppm we have reached today. How Antarctic ice would be affected by different emissions scenarios. GtC stands for gigatons of carbon. But this does not provide a particularly helpful guide to future ice sheet susceptibility. These past warm climates represent intervals of millions of years of elevated atmospheric CO2, whereas in the future, CO2 levels will start to drop back down once fossil fuel emissions cease. And this brings us to the crux of the problem, at least from my perspective: just how quickly will CO2 decay back down toward 278 ppm, the preindustrial atmospheric concentration? There are a variety of processes that will act to progressively remove CO2 from the atmosphere, starting with uptake by the ocean and the terrestrial biosphere, occurring on timescales of up to 1,000 years. There are also a series of geological processes, involving first reactions of carbonic acid (CO2 dissolved in water) with calcium carbonate minerals in chalks and limestones and then ultimately, the gradual dissolution of silicate rocks such as granites and basalts over hundreds of thousands of years. Can the ocean absorb enough CO2 before too much ice melt occurs? What about the geological processes – are these really too slow to help in time even under a much warmer climate and faster weathering rates? 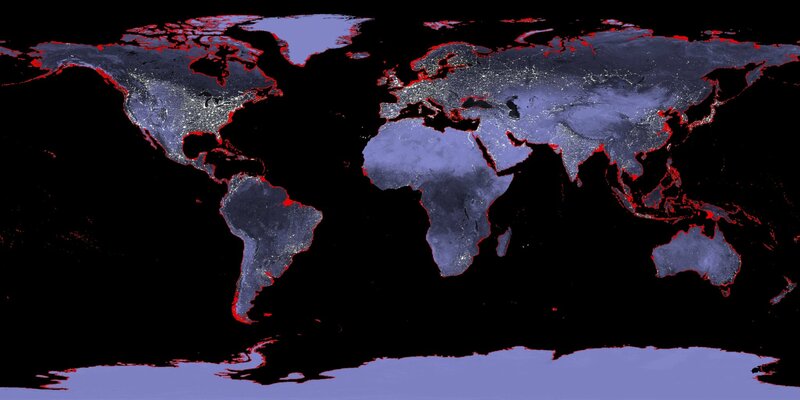 This map shows the changes to coastlines if sea level rose six meters. Recent projections show that continued fossil fuel use over the next 1,000 years will lead to sea-level rise of 100 feet. Without access to a time machine, I constructed numerical models that incorporate as many of the key processes of the global carbon and climate system as is feasible. To run a model to simulate many thousands of years, I must leave out many of the atmospheric physical processes, but the basic CO2 response is carefully tested and relatively independent of the omission of monsoons and El Ninos and all the complex short-term dynamics of the real climate system. We then ran the model forced by a wide range of possible CO2 emissions scenarios, from 1,000 gigatons of carbon to 10,000 gigatons. To date, people have cumulatively emitted close to 600 gigatons, so we are easily on track to soon exceed the minimum assumption we tested in the study. Even before considering the Antarctic ice sheet response, an unexpected result emerges – once enough CO2 is emitted to the atmosphere, climate almost gets “stuck” in a warm state that persists for the ~8,000 years until the end of the model experiment. There are two things at play here: first, the more carbon we emit to the atmosphere, the less effective the ocean is in absorbing it. Basically, at some point, the main mechanism by which the ocean absorbs CO2, which is chemical reaction with carbonate ions (CO32-), gets maxed out (in other words: there are no more carbonate ions left to react with). This is also the way in which ocean acidification occurs. A warmer ocean doesn’t help, as CO2 is less soluble at higher temperatures and prefers to stay in the atmosphere. What about the geological sinks? Yes, they are working hard, and atmospheric CO2 does decline in all experiments, but just not quickly enough to avoid large-scale melting in Antarctica. The second thing concerns the underlying nature of the relationship between climate and CO2. Per molecule, CO2 becomes progressively less effective at trapping outgoing heat (infrared radiation) the more molecules that are already there. For society, this is a good thing: instead of each gigaton emitted having the same additional climatic impact, you have to approximately double the excess CO2 in the atmosphere to raise the surface temperature by the same amount each time – a log relationship. In our experiments, we see the flip side of this in response to the highest carbon emissions scenarios. Because we require a halving of CO2 to give us the same cooling each time, surface temperature declines even slower than CO2 concentrations. In a nutshell: if we were to burn all fossil fuel reserves, the Antarctic ice sheet is threatened in its entirety, principally because we break the ability of the ocean and other natural mechanisms to bring atmospheric CO2 concentrations down fast enough. The future climate patterns we simulated then drove the ice sheet model, which is absolutely key and is as carefully tested as any of the other model components used in our study. As expected from previous work, for low-emissions scenarios, the ice sheet actually gains mass due to increased snowfall over the coming century. However, on the long term, it is the surface warming and associated melt that dominates the mass balance. And as the ice sheet melts, things go from bad to worse: surface temperatures get warmer as the elevation of the ice sheet falls, and sea-level rise increasingly helps to destabilize the ice sheet from below. [So] the spoiler is: “yes,” although in our recent computer modeling-based study, we find that it would require all of our fossil fuel resources to do it, and to see the very last of the ice melt, we might have to wait as long as 10,000 years. The rest is history. Or need not be. I hope that consuming as much as 10,000 gigatons of fossil fuel carbon is unlikely. But we also found that sea level progressively creeps up once we look beyond the end-of-century focus where much of the climate change debate is focused, for all scenarios. Even for really rather moderate carbon releases, sea level could rise 5-10 meters, or about 15-30 feet, by the end of the millennium. Hence, a genuinely plausible scenario is that the world’s coastline in 50-100 generations’ time is going to look very different. Now is the time to invest in far inland “beachfront” real estate for your great-great-great-…-great-grandchildren.